In October of 2008, Chicago-based drug trafficker Margarito “Twin” Flores was summoned to the Sinaloa Cartel’s mountaintop compound. The leaders of the Mexican narcotics syndicate were pissed. The brother of a top lieutenant had been arrested by the government and risked being extradited to the United States; the Sinaloans wanted to retaliate — in a massive and deadly way, and in the heart of Mexico City. “Let it be a government building, it doesn’t matter whose. An embassy or a consulate, a media outlet or television station,” cartel boss Joaquin “El Chapo” Guzman said. Even the U.S. embassy might be fair game. “Make it your job,” Guzman said. At least, that’s how Flores says the meeting went down. Now an informant for U.S. authorities, Flores described the meeting in a proffer filed in U.S. District Court in Chicago (.pdf) and first described by the Chicago Sun-Times. Following the meeting, Flores told a DEA agent about the plot and asked for “black market prices for rocket and grenade launchers.” This way, he’d have something to report back to the cartel. The proffer presents an audio transcription of that report. “That’s fine, just let me know,” Zambada answered. But the Sinaloa Cartel didn’t find any veterans willing to supply the weapons, and the would-be attack went nowhere. Why? In the states where they hold sway, the drug lords routinely massacre policemen, mow down attorneys and reporters, and very occasionally kill U.S. officials. A frontal attack on the government in the capital city, however, is a rarity. Yes, there was one grenade blast near the U.S. embassy in Mexico City in 2008, but that could’ve easily been the work of leftist guerrillas, too. The proffer alleges Guzman and his lieutenants chose the capital city because it was at the time controlled by rival drug lord Arturo Beltran Leyva, who would presumably be blamed. Bottom line: The Sinaloas didn’t want to take the heat for such a bald-faced assault. It’s also difficult to believe the world’s largest criminal organization was short of weapons when balanced with reports dating back years about the cartels blowing up police vehicles with high-explosive projectiles. In Murder City: Ciudad Juarez and the Global Economy’s New Killing Fields, author Charles Bowden claimed the Sinaloa Cartel’s smaller rival, the Juarez Cartel, has been in possession of rockets since the late 1990s. Meanwhile, Zambada claims he was also snitching for U.S. agents — a claim denied by federal prosecutors — and was allowed to smuggle cocaine into the U.S. in exchange for information on the cartel’s rivals. It wouldn’t be the first time. Another informant working for the Juarez Cartel was apparently known by U.S. officials for his hobby of dissolving murder victims in lime. Such claims of collaboration between governments and organized crime, however, weigh heavy in Mexico, where the Sinaloa Cartel is widely believed to be linked with top Mexican officials and the military. This was made worse by Operation Fast and Furious, an enormous screw-up by the Bureau of Alcohol, Tobacco and Firearms to allow 2,000 guns bought in U.S. gun stores to “walk” unobserved into Mexico in the hope of building cases against top cartel leaders. 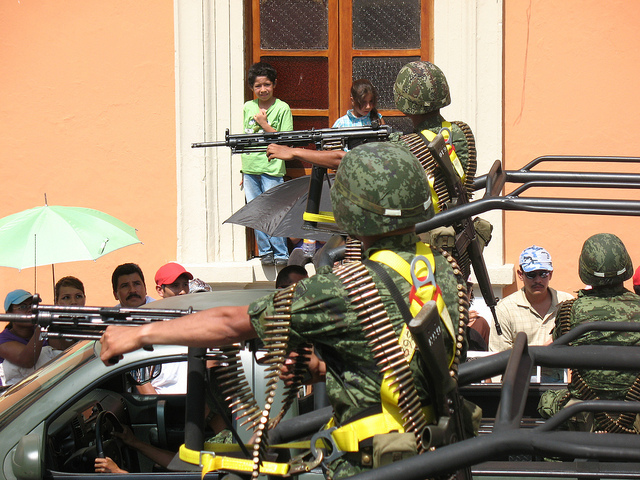 Enough guns arrived in Sinaloan hands — and at Sinaloan assassinations — for the ATF’s Mexico attache to say the U.S. effectively “armed” the cartel. On the other hand, “[Zambada] has absolutely nothing to lose by saying this since he is looking at considerable prison time. Possibly he is trying to cut a deal for a reduced sentence,” Robert J. Bunker, a professor at the American Military University and California State University’s National Security Studies Program, said to Mexican magazine Proceso. Rule one: When tasked to weigh competing claims made by former participants in a mercenary drug war fought not over loyalty or ideology, but money and drugs, take the claims of all sides with a grain of salt.